The property forms one half of a large Victorian semidetached property. Formally, the only access to the garden is through the utility room and garage. The utility room window provides a limited view onto the garden. Doma Architects redesigned the layout of the rear ground floor rooms and added a small extension to improve the useability of habitable accommodation within the existing property and provide a direct visual link from this main living accommodation to the garden at the rear. The contemporary element to the rear is clad in black stained timber and the main openings are framed in an overhanging soffit detail. 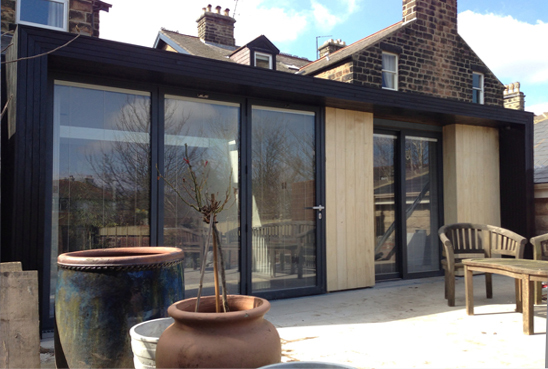 Within this frame are set sliding folding glass doors with a black painted aluminium frame. Sections of vertically boarded timber panels and vertical timber slats soften the overall appearance and are layered to add depth to the elevation. A new raised terrace continues the internal floor finish externally and extends the living space seamlessly out into the garden..